The top seeds may have won the tournament, but the ITA National Men's Team Indoor Championships was full of surprises before the University of Virginia actually got their trophy. After a tough quarterfinal win over UCLA (4-3), the semifinal match came down to the No.1 singles. Cavaliers Somdev Devvarman took out Erling Tveit, 4-6,7-6(5),6-0 and Virginia overcame Mississippi for their second Indoors final. As surprising as that semi was in its close final score, it was nothing compared to the other shocker. 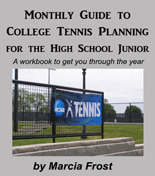 After 38 straight wins (including an NCAA title), the Georgia Bulldogs were taken down. The winners were the Ohio State Buckeyes and they took the defending champions, 4-1. 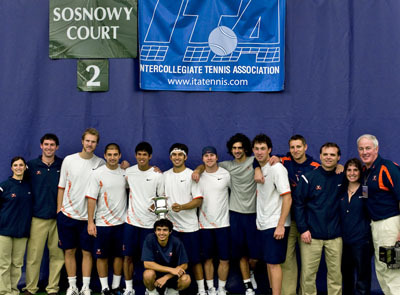 The finals were a bit less dramatic than the semis as the University of Virginia picked up their first ITA Indoors Team trophy with a 4-1 win over Ohio State and defended their No. 1 ranking. The ITA Sportsmanship Award went to Erling Tveit (pictured above with coaches Billy Chadwick and Matt Anger).